3.5inch Colour TFT Display with easy to use menu driven operation. Audible Signal Strength ‘Beep’ and Silent Vibrate Mode. The CAM-105w is designed to detect and locate transmissions from cellular mobile phone based devices including mobile phones, PDAs and smartphones, vehicle trackers, GSM listening devices (bugs) and covert wireless 3G/4G cameras. It can be used in sensitive meeting rooms to check for hidden devices, unauthorised mobile phone usage in offices, exam halls, hospitals or prisons and in vehicles to locate hidden tracking devices. 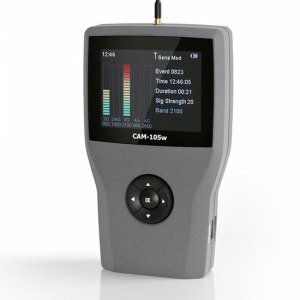 The CAM-105w also has a separate 2400 Mhz band detector for the rapidly growing threat from Wifi/Bluetooth/Video devices. It offers unprecedented levels of detection in a handheld unit and logs all cellular activity within range. The CAM-105w will detect signals from existing 900 MHz (2G), 1800 MHz (2G/4G), 2100 MHz (3G), plus the new 4G Cellular bands 800 MHz (4G LTE) and 2600 MHz (4G LTE). Multiple high gain amplifiers ensure detection up to 50 meters depending on signal strength and ambient conditions. A simple, intuitive menu driven system displayed on a colour TFT screen allows the user to perform real time detection or to view events that have previously occurred. Each band has an individual 20 element signal strength meter enabling the precise source of a detected signal to be located with ease. An audible ‘Beep’ mode allows the user to monitor without looking at the display and a silent vibrate mode can also be used for particularly sensitive areas. Up to 4000 cellular events can be stored within the CAM-105w for viewing as list or graphically. For each detected signal (no matter how long or short) it will record the Time/Date, Duration, Band detected and Signal strength. This can be particularly useful in identifying the type of device that is being detected. For example: a string of regular short bursts in one particular band may represent those from a GSM/GPS Tracking device. These could be clearly viewed in Graph Mode as lines of regular spacing representing the pulsing nature of the transmission. Also by looking at call activity at certain times of the day may help identify unauthorised phone use in sensitive areas such as prisons, company board rooms, exam halls, etc. The entire event log can also be downloaded to a USB stick for storage or transfer to a computer where it can be viewed/sorted for analysis or reporting. 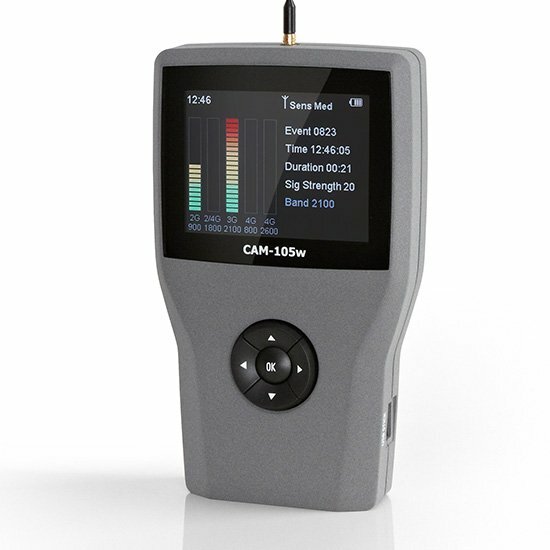 The CAM-105 also features an additional separate 2.4GHz Wireless real time/log detection mode. This is designed for detection of the threat from a new generation of wireless devices which use this band such as Bluetooth and Wifi devices. Such devices can for example, record audio over long periods and then transmit it in short regular bursts. It will also detect other devices that use this band such as wireless video. Complex algorithms analyse the detected signal to help identify the signal type. ie. Bluetooth, Wifi, or other 2.4Ghz signal. The 2.4Ghz Wireless detection mode stores the last 24 hours of activity which can be viewed graphically for later analysis. The CAM-105w is designed and manufactured in the UK to the highest specification and is enclosed in customised machined aircraft-grade aluminium enclosure. It uses an integral Lithium-polymer battery pack and is supplied with an international charger. The complete system is supplied in a heavy duty military standard carry case for ultimate protection.